1-2-3 Word Search Maker is an easy to use software tool that allows you to make word search puzzles from your words. Choose from 5 different letter sharing options, everything from words cannot cross or share letters to words can be completely hidden in another word, and everything in between. Capitalize all of the letters in the grid, none of the letters, only the first letters of the words, or capitalize the first letters and some decoys. Let's admit it--it's easy to copy someone else's word search puzzle. One glance and you can see where the words are and what direction they are going. So we solved this problem! Just choose the number of puzzles you want, and the program will print out each puzzle with the same words but a different arrangement. No cheating is possible as each puzzle is unique! Plus, it requires no extra work on your part. Bonus: you can memorize your settings so each puzzle starts out the way you like it. learn from them.....what more could a teacher ask for?" try it for yourself before you buy. Buy it now, use it now. After purchasing you will immediately get an unlock code that lets you save your work. 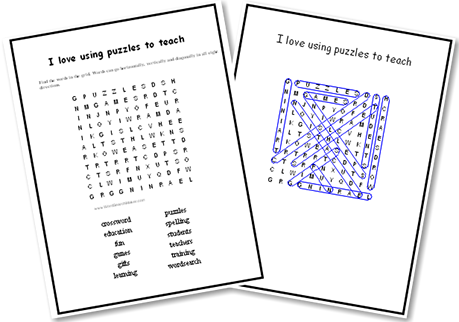 However you use your puzzles, 1-2-3 Word Search Maker will help make them a success. Click here to Download the demo version of the word search maker.